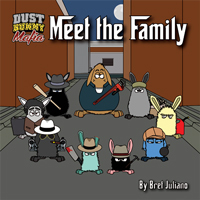 In three weeks, I’ll be promoting the Dust Bunny Mafia at another library mini comic con. This time it’s at the Niles-Maine District Library in Niles, IL! Join us on Saturday, August 19, 11am-3pm for an event celebrating comics and pop culture. MeTV’s Svengoolie will be a special guest hosting a meet and greet for fans. Fandom Fest will feature an artist alley, trivia contests, a cosplay parade, creative workshops, and more family-friendly fun. We encourage attendees to come dressed as their favorite character.